I’m all for getting some help in providing meaningful feedback to students but I don’t see where this app would make any significant improvements, except in reducing the amount of paper used. I tried ClassKick a few weeks back, and my Algebra students really enjoyed it. They liked that the multi-slide experience was self-paced, and even 8th graders will work their tails off at the chance to receive a virtual sticker… honest they will! Using ClassKick and allowing students to talk together as they wrote their own individual work was effective. I haven’t tried the feature yet that allows students to give written feedback to one another, but the novelty of my “ghost-writing” on their iPad screens from across the room had them begging me to look at each and every slide from every student. It was crazy tough to attempt to give written feedback to every student during our live session, but I’d consider giving feedback when they’re offline too. If I understand correctly, they would see the written feedback the next time they log in using the same code they used to join the session initially. The first thing I thought about after seeing the tutorial was that I could start a mini saturday school lesson for those students that need or want the help. Also, some of my students have a lot of after school activities, I have meetings and trainings, so I could see setting a time where we could review some work. I’m very psyched to try it!!!! Classkick sounds cool and all, but as a live production with 45 min periods, I don’t see it happening for me. Outside of class time is incredibly short to be able to actually provide written feedback that is helpful and conveys the right tone. Robots may not be good enough yet, but I feel like if we were to recruit every software engineer on the planet to help voluntarily like a Wikipedia effort, along with every teacher voluntarily uploading student work we have given feedback to, we could come up with a way to provide great automatic feedback for our students. We could create voice overlay as well to go with “written” feedback that is directly tied to the work done the student did since the software would recognize the handwriting and the mistakes and successes. Again this would take maybe millions of software engineers and teachers working together to make it a reality. Check out mass collaboration like in captchas that digitize books or duolingo that translates the internet. Thank you for the critical feedback! We really appreciate your honest criticism – your reflections as educators are the best way for us to improve Classkick for your classroom. Would any of you be interested in speaking with one of our co-founders to tell us more about how we can improve learning in your classroom? If so, please email me at laura@classkick.com! Thank you for your praise and blog feature. Let me know if you want some support to try turning on student helpers! Please let me know what you think when you get started! Our larger hope is to provide a place where students can get help from anyone, whether they are in person or across the world. We’d love to get your feedback on how it goes the first time you use Classkick! Added Jesus’ comment to the main text of the post. I like Chett’s optimism. But I think teaching a computer to understanding a student’s exact understanding and misunderstanding about, say, fractions, is an order of magnitude trickier than identifying blurry numbers in a CAPTCHA or even predicting what movie I’d like to watch next given my Netflix viewing history. Classkick seems pretty cool. I teach enormous lectures at a large university, and even when my office hours are popular, I’m still only meeting with about 10% of my students each week. An online forum helps, but plenty of students seem too embarrassed to use it. So what I’d really enjoy is the ability to upload practice problems on Classkick and tell my students to work there, where I can give feedback. It doesn’t seem like PDF importing is an option yet, but maybe it will be soon. Aaaaand after playing around with the features a little more I am not super impressed. Perhaps I’ve spent too much time being spoiled by GoodNotes, but I find this impossible to write on. I’ll come back to it in a few months, though. Maybe things will improve. What made this app useful is that I already have the relationships with my students that are fundamental to working together. In this case, we extended our workspace to a virtual whiteboard, which was easy after countless hours on a real whiteboard in the real classroom. I searched for a few years for a virtual whiteboard my students could access in order to discuss homework problems, and get help with solutions while they are working on them (as opposed to taking up class time in the next lesson). 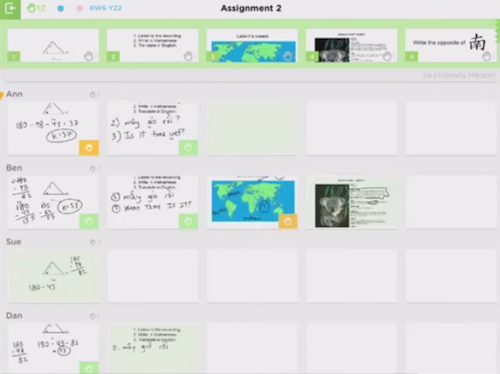 Classkick can be that virtual whiteboard. The goal for me with this tool is not to replace class time, or student-teacher interaction. It is to allow more flexibility in the timing of student learning. I already answer student questions via email at home, where they send me scanned images, iphone pictures, or poorly-typed math expressions. Classkick eases this process by allowing hand-written work to be shared with ease! It is to allow more flexibility in the timing of student learning. I already answer student questions via email at home, where they send me scanned images, iphone pictures, or poorly-typed math expressions. Teaching isn’t an “on call” job, so don’t be surprised if this use doesn’t exactly get an enthusiastic response. I teach my daily load, do voluntary after-school tutorials three days a week, coach some sports teams and do more preparation than the average Maths teacher on top of that. So I’m not a shirker. But there’s no way in H*ll I’m going to be answering questions in the hours I have off. With the best will in the world, I can’t be a personal tutor for over 100 kids. You’re assuming it has to be you. Why not a set of people at the district office? Or a division at your textbook’s publisher? Because the government pays me to be their Maths teacher. This app would be a great tool for differentiation as well. Instead of using this for the whole class, you could use for a subset of students who need additional tutorials outside of class (ex. Coach Class or at Saturday school). Since it is difficult to give feedback to a whole class of students at once, it would be good to test this out with a smaller group first. We are currently working on releasing an option to import PDFs directly into Classkick – it should be available in a few weeks. We will continue working on our writing so that it responds the way you would like – thanks for the suggestion! If you’d like to provide us with more feedback, I’d love to chat! Please reach out to me at laura@classkick.com. And Dan, your suggestion to Chester is EXACTLY what our hope is – that all students would be able to get the help they need from ANY interested influence in their life – be that a coach, a teacher, a tutor, an aunt or uncle in another country… and the awesome people you listed as examples. I definitely agree that captcha isn’t the exact way. I am thinking more like wikipedia where we can recruit 100k engineers to collaborate somehow to create handwriting recognition combined with assessment of the math. It would have to be a cultural movement in order to make it happen, thousands of teachers sharing their students work and how they’d provide feedback. I think your app is fantastic, I was merely suggesting the next evolution. I am trying to get more carts of iPads for our school so I can use them more often. Once I can import my PDF worksheets and upload great problems, then I am excited to see the usage increase too. I have been using ClassKick for about a year, and it has been beneficial to learning in several ways. I see student annotations in real time, so I can easily spot when they are ‘stuck’ and offer real-time prompts to assist. I add hyperlinks to brief instructional videos to support learning. Shy students who NEVER speak up in class are willing to ask me questions electronically. Maybe it is the novelty and maybe it is the extra support, but the average learner is simply more persistent in completing tasks in ClassKick than they are with paper/pencil. I have, however, found it quite challenging to keep up with students’ electronic requests for me to check their work. I have limited the number of slides to four in most cases to lessen this challenge. I also find it easier to manage the teacher workload if students work in pairs.